Five southern Rotary clubs came together to raise $73,000 in a Man v Woman fundraiser held late last year. The event was a triumph for the combined Rotary Clubs of Invercargill South, East, Sunrise, North and Aparima in a landmark collaboration with Spirit of a Nation, according to committee member Christine Pryde. “The key objectives of the night were to bring Southland Rotary Clubs together, show the general public the Rotary organisation in a fun way and raise some serious money for the clubs’ chosen charities. Working together we pooled our resources, talents and networks and achieved an outstanding result with less effort and more fun,” she said. Southland Schools (Aparima), Southland Literacy (Invercargill East), Give Kids a Chance (Invercargill North) and Fountain of Peace NZ for Ugandan Housing (Sunrise Rotary). 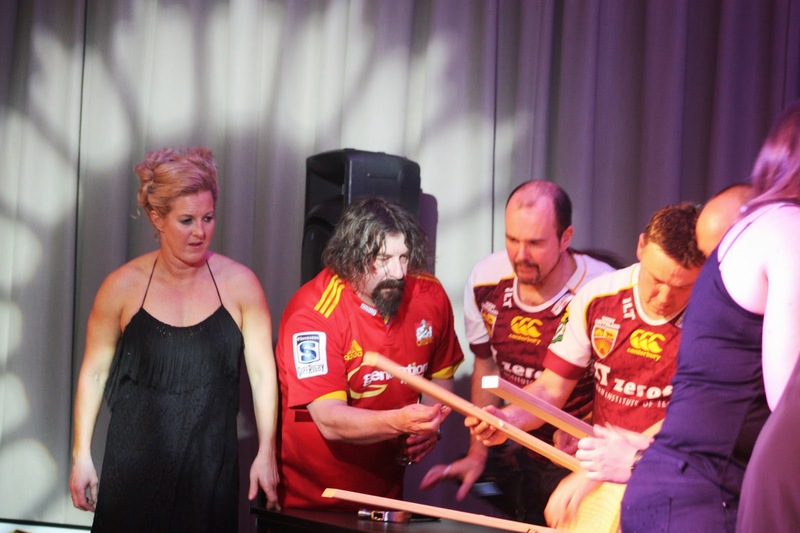 The fundraiser consisted of stage competitions between two rival teams – in this case a gender battle between teams of celebrities, who brought some magic to the night, Southland Spirit of a Nation brand manager, Gerry Forde said. “Rugby player Jamie MacIntosh put his body on the line for the men as if it was the Otago v Southland clash at Rugby Park, with heaps of support from entertainers Bryan Townley and Stephen Broad – the men proving just a little bit larger than life for the women’s team led by the dynamic Mary-Jane Thomas,” he said. Honours were equally divided after the stand-up comedy, quiz, goal shooting, modelling, building, sing-off and theatresports with the men taking the victory based on audience support for their grande finale lip synch which peaked with crowd-pleaser “YMCA”. Around $60,000 was raised by auctions including one item for a crew of Rotarians to paint a house that fetched over $6,000 and a solar panel system from World Solar that reached $4,500. Both Spirit of a Nation and Rotary are keen to look at repeating the success again next year, said Gerry Forde.